Captain Rupert just does not know what a lucky bunny he is. He had toast for breakfast. He goes bonkers if his in the house when I'm making toast, jumping up at my feet, its hard not to trip over him. 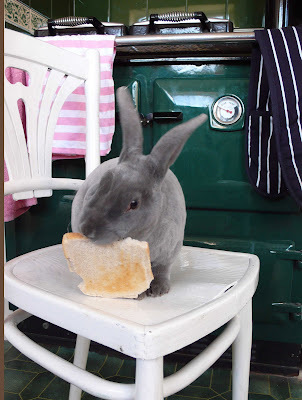 I normally make him wait and then we have toast together as I cut the crusts of for him. If I have my toast on the sofa, he will jump up and help himself right of my plate. Today he was so chuffed I treated him to a whole slice of his own. And then into a sunny garden, he sits on the sunny side under his favourite hedge basking in the suns rays. Oh dear what a mess and such a naughty Kitty, but who could resist that sweet Innocent face and she is having such fun after all. 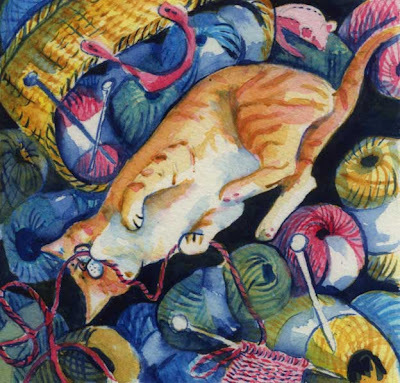 Does it really matter if shes pulled out all the wool from the knitting basket, and that bit of knitting oh well.... She would tell you that chasing pieces of wool is such good practice for hunting those pesky mice, how else could she sharpen up her reactions. Just so long as she stays away from my newly decorated lampshades. We have a camera again back from the menders working like new. So I can show you how busy we have been with the house. The bedroom is getting there, I have done these lampshades to match the curtains. 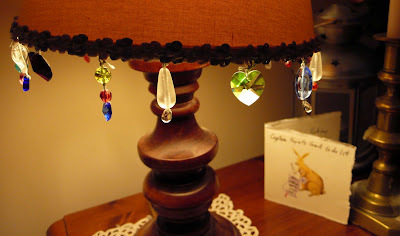 I'm still thinking of adding more beads they catch the light and sparkle. In the back ground is K's birthday card, the righting on the card reads 'Captain Rupert's great today list'. As he has had a huge list of building wardrobes, painting fences, chopping wood, its endless but we are nearly at the end of it for now. 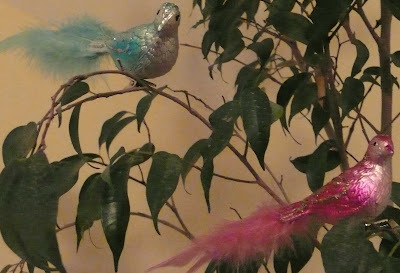 These two birds flew in the window to roost in the bedroom, I have let them stay, as they match the other colours in the room. I hope that Kitty stays away from them. 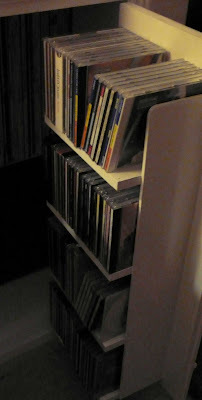 K has build wonderful cupboards and shelves, this cupboard even has shelves in the doors, to hold Cd's. How nice the sun came out the other day the wild wind had stoped for a little light relieve. I could almost feel spring is round the corner. The birds busied themselves singing as they went, enjoying going out with out there feathers being put out of place. 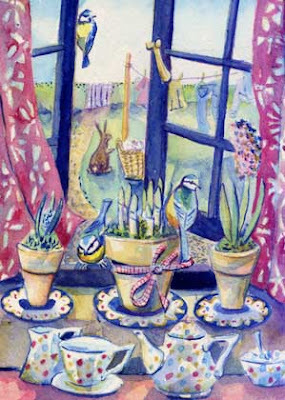 The washing went out to dry, and the windows opened to let the fresh air wonder in and dry the house out. Captain Rupert hop, skipped, jumped bounced in between the shoots of the daffodils and right down to the bottom of the garden and back again in a flick of his tail. Such joy he felt for soon would be the very best time of the year that all bunnies love - spring. Captain Rupert has been feeling sad I have not been able to show you any pictures of him (he knows how handsome he looks), so he thought it would be nice to share one of the rabbit books we have been reading. This is Tim rabbit from Ten Tales of Tim Rabbit, from the Tim Rabbit series by Alison Utterly, the same author as wrote little grey rabbit. 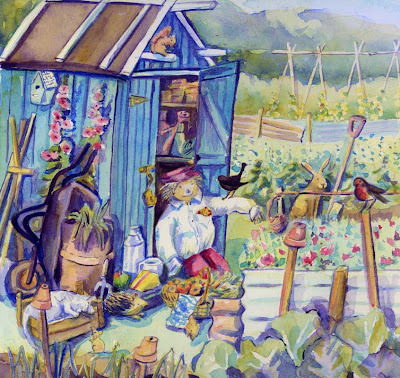 Tim gets into all sorts of mischief, which scissors being naughty at rabbit school and befriending a scarecrow. I found this little book before Christmas, I was having a little bit of a book thing, I love books and every time I tried to do some Christmas shopping I seemed to keep finding little books I could not resist. This book was all in the name of research as I would like to have some Captain Rupert stories. I'm working on a little project with someone, but I'm not going to say anymore for now. Or in Captain Ruperts case hopped, skipped and jumped in. 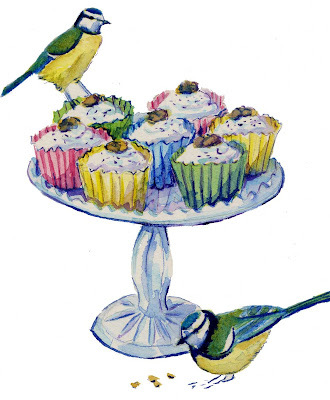 In the absence of a camera at the moment I just had to paint the cupcakes I made the other day. 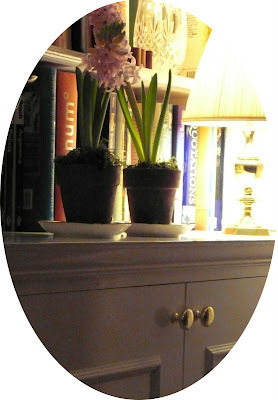 So you could see how pretty they looked a lovely vintage glass cake stand, too good to eat, well nearly. I have gone a little cupcake mad at the moment. I think its having a Rayburn that gets up to temperature, you just want to keep popping yummy things out of the oven, just like magic. We have finally had the Rayburn signed off today I feel very relieved, its been months of arguments with the installer which have left us all feeling very drained. Its emissions and a oil leak have at long last been dealt with, three cheers and hurrah and more cupcakes please. Better not... we have decided there needs to be a little dieting, had by every one. We are still here, we have been busy painting and sorting out a new catalogue and tidying a very messy work room, things had just been left from when we moved in and had not been organised. I can't believe its been left so long. K has been doing organising of the bedroom by building a fitted wardrobe, which is looking very good and is on too shelves in the spare room. Captain Rupert has taken to keeping guard outside my work room, sitting on the top step of the stairs. His not there to day as he refuses to come in from the garden the sun was nearly shining and his making the most of it. He had meant to share pictures of his 7 favourite look out posts when he was tagged before Christmas for 7 random facts, his most upset both our cameras have finally completely given up. Top of the stairs, just outside my work room, he has to check up on me! At the bottom of the stairs, its far enough away from the living room to be cool but close enough to the fridge, so he can keep an eye out for when carrots and toast might be on offer. By the gate into the vegetable patch, well it might be left open one day and what a feast there might be. At the base of the bird table, they can be very friendly to have a natter with, also if its raining he can see if I'm going to take pity on him and let him in the house. Under the hedge, excellent few of all the garden well out of the way from next doors dogs and very goof for hiding when he does not want to go back into his house. The other side of the garden, its excellent sport to taunt next doors dogs and see them drawl, his not scared his a captain, I'm not so sure and it worries me a little that one day they will get through.